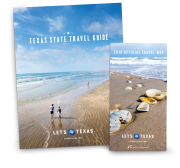 Texas has been a proud home to all kinds of artisans, handcrafters and makers for generations – and it shows in the high-quality goods you’ll find around the state. To hear the artists’ stories, go straight to the source with museum and factory tours, flagship stores and classes where you can even try your hand at building a creation of your own. Looking for a souvenir with authentic Texas roots? Saddle up for an historic display of artisanal leathercrafting at the King Ranch, near Kingsville. Over a century ago, when Captain Richard King couldn’t find ranching goods fit for his Running “W” cattle brand, he hired experienced craftsmen and started his own saddlery. Today, you can watch their master saddle maker at work while you browse for exquisite leather goods and sundries at the King Ranch Saddle Shop. For a Texas-sized dose of inspiration, discover the pink-hued empire and legacy of a local icon at the Mary Kay Museum in Dallas. Mary Kay had a dream of empowering women to gain financial independence through quality beauty products, and over the course of decades, she turned her dream into a worldwide company. You’d be hard-pressed to find a Texan home that doesn’t have at least one piece of James Avery jewelry in it. Famous for their simple designs, quality materials and hundreds of delightful charms to choose from, James Avery is a beloved local jeweler with an incredible origin story. At their corporate campus visitor center in Kerrville, you can learn more about their inspiring history and find the perfect piece to take home. While you’re in the Hill Country, make time to stop at Wimberley Glassworks. Here, you can connect with an artisanal craft that dates back millennia as you watch glassblowers shape stunning pieces of decorative and functional art. They even offer classes where you can learn the history and techniques of glassblowing while making a delightful flower or paperweight. In San Antonio, you can walk through the creation journey of the most comfortable shoes in the world at one of the last shoe factories in the country. At the SAS Shoe Factory and General Store, you can observe the 100 steps it takes to make their shoes. Then, you can choose a pair and take ‘em to go. And while it’s not everyday wear for the majority of Texans, chances are you’ll see a ten-gallon hat while you’re here. Go straight to the source at with a trip to Hatco in Garland to see where and how the most classic and high-quality brands are made – including Stetson and Resistol. If you’re not too keen on taking home an authentic cowboy hat, you can also choose from a vast selection of fedoras, bowlers and other snazzy styles. Then, with hat in hand, you can head to M.L. Leddy’s in San Angelo to leave your footprint – or bootprint, rather. 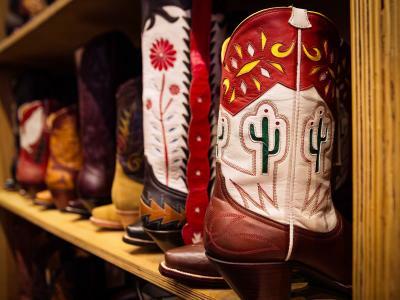 If you purchase a pair of their handmade boots, you’ll join over 250,000 customers, including presidents and rock stars, in their footprint ledger. While you’re there, you can sneak a peek into their boot making process, currently run by fourth-generation bootmakers. Want to see some Old West wonders? You’re in luck! Save some time to gawk at an extensive collection of hand-tooled leather articles, including saddles, a guitar case and a leather picture, at Tandy Leather’s Museum & Gallery. You’ll find this hidden gem at their Global Headquarters in Fort Worth. To round out your tour of Texas leatherworking, get a glimpse into how hand-crafted baseball gloves are made at the last glove factory in the country. On your Nokona Factory tour, you can watch the process from cowhide to break-in – and you can even take part by operating the glove buster before they ship out. For a girls’ day out or an extra special gift, get your sparkle on with the Austin-based jewelry sensation Kendra Scott. At their flagship store, you can search for beautiful, locally crafted earrings, necklaces, bracelets and rings. And to add a personal touch to your collection, you can visit the Color Bar to create your own custom piece. 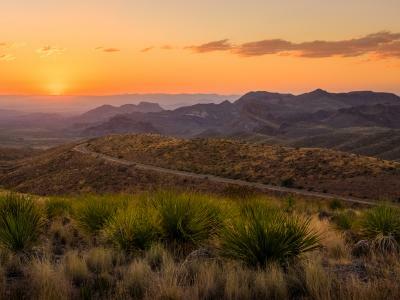 If you’re the type of traveler who likes to take home local finds, one-of-a-kind pieces and unique experiences to go along with them, Texas is the perfect place to explore. Visit these shops and museums to learn about the crafters and artisans that make our state a hotbed for quality creations.